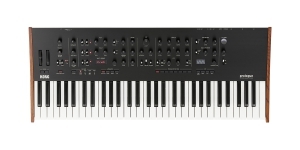 Korg Minilogue is a modern compact analog synthesizer with digital control. 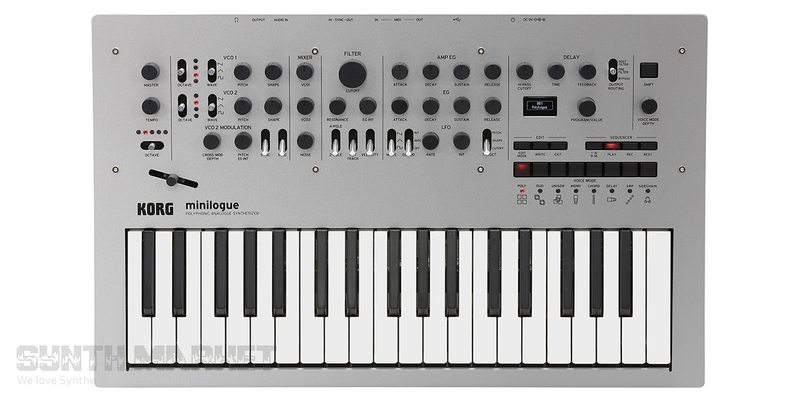 The structure of the minilogue comprises a low-frequency oscillator (LFO), voltage controlled oscillators (two per voice, 2VCO), a voltage controlled filter (VCF) and an amplifier (VCA). 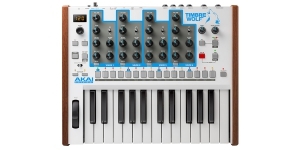 The synthesizer is equipped with two 4-level envelope generators (EG); one is for the amplifier, and the other is for modulation effects. 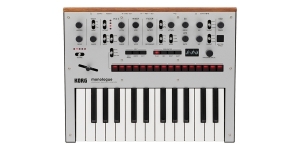 The sub-oscillator - one or two octaves below the master one - is available in mono mode. Powerful effects are represented by ring, pulse width, and cross modulation. There is a synchronization function offered for oscillators. The generated waveform (saw, triangle and square) can be displayed and observed in real time on a small oscilloscope. 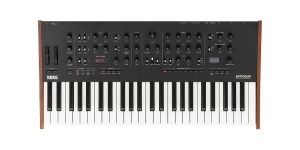 In addition, the display shows a menu that helps you to understand any action, since almost every of the synthesizer functions is routed to the front panel controllers, which makes the device intuitive to use and a suitable platform for improvisation. 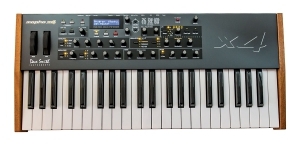 The sound production process is characterized by a 4-voice polyphony and 8 voice modes: polyphony, duophonic, unison, mono, chord, arpeggiator, chain and voice delay mode which should not be confused with the delay effect - one of the main advantages of this model. The delay effect is assigned to a separate control unit on the front panel, the first controller of which manages the low-pass filter. The filter (12 dB and 24 dB) is represented by the cutoff frequency, resonance control and offers an adjustable influence of the envelope generator on the cutoff frequency, as well as the keyboard tracking and velocity sensitivity switches. 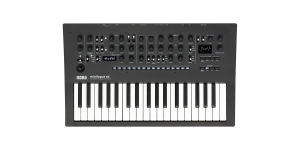 With the help of the real time control (Motion Sequence), a variety of modulation effects, analog oscillators, voice modes, details such as noise control, and easily accessible controls, the instrument achieves a rich and specific sound offering numerous combinations. 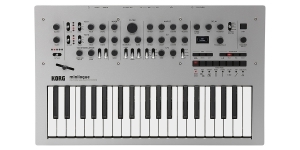 The 16-step sequencer, which can be set and adjusted in editing mode, records both in real time and stepwise, and each sequence can store up to 4 automation clips. 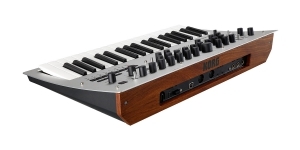 Korg offers 100 factory presets and the same number of user ones. 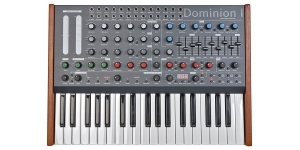 The rear panel is equipped with a mini-jack input and output for synchronizing the synthesizer via CV (compatible with Volca, Electribes and SQ-1, as well as other synthesizers), a mono-jack for headphones, audio input (can be processed with filters, envelopes and delay), and MIDI and USB connectors for a computer with MIDI support via USB. The refined design also attracts attention thanks to its chiseled construction and rich materials: the rear panel is made of wood, the front one is made of a thin sheet of aluminum, while rubber controls and metal switches are quite enjoyable in use. 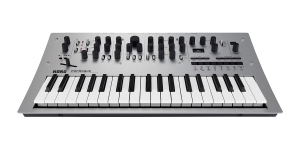 This is a polyphonic hybrid synthesizer that taken the amazing features from Minilogue and Monologue, but will be equipped with a full-sized 4 or 5-octave keyboard and, which is surely important, will have 8 or 16 polyphony voices and 3 voices per oscillator! 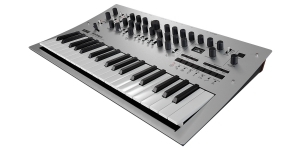 Korg tricked the music world into guessing game and it wasn’t a leak – it was actually pronounced by Korg Vice President John McCubbery in September that the company is going to surprise with a new product. The announcement is prepared for NAMM 2018.